A stuffy nose is never any fun. You can’t breathe properly and sleeping can become a difficult experience. A runny nose can be just as annoying, especially when you’re surrounded by people and all your attention is put on constantly blowing your nose and cleaning your face. To deal with nasal congestion, most people reach for over-the-counter nasal sprays. But there are disadvantages to using chemical substances. These sprays are drugs, so there may be side effects and they can become addictive. Wouldn’t it be better to master an approach that is less invasive and, in many cases, more effective? The simple technique I share here was found in an article from the Herbs Are Nature’s Medicine site and is based on acupressure. It uses gentle pressure to four points of the face to help you clear your nose. Use your fingertips to apply gentle pressure. Use round movements – the movement is a pushing-releasing type of rotation. Do the cycle 3 times. 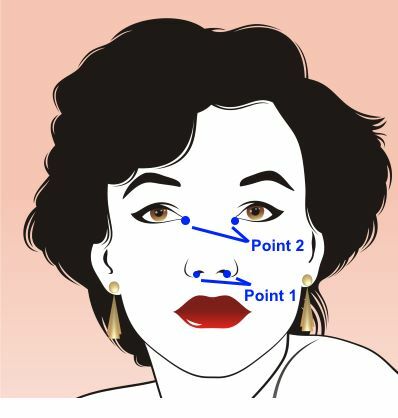 Point 1 is located on a cavity at the corner of the nostrils – it’s the bottom part of your nostrils. 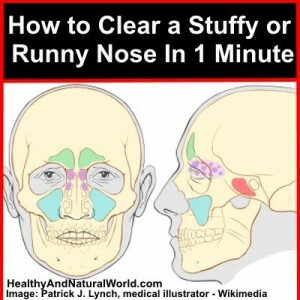 Gently push the nostrils together with a rotating movement. As you do this, you almost close, and then open the nostrils. Perform the movement 10 times. Make sure not to push on the nose cartilage. You’re only pressing the bottom part of the nostrils. Point 2 is located just below the corner of the eyes, near the nose, where the tears come out. Perform a gentle rotation at this point 10 times. Don’t lift your fingers, but just move the skin, so you feel the corner of your eye as you push. Point 3 is behind your earlobe, at the bottom part of the ear, in the cavity just below the cartilage. Push and release the point 10 times, without applying pressure to the cartilage. The rotation you do is not wide, but a subtle movement. The last point is the earlobe itself. Gently massage the earlobe 10 times. After going through the above four acupressure points three times, you should feel immediate symptom relief. For best results, repeat the procedure again after 10 minutes. The described technique is simple, safe, can be done anywhere and anytime, and comes at no cost. It is also a good and empowering experience to be able to use your own body to heal yourself. If successful, pass it on, and help other people control and use their bodies better, too. This entry was posted in Natural Remedies by Heather. Bookmark the permalink.